After 8 years I’ve officially resigned from my tech integration role at PLC Sydney and, starting on January 1 next year, will be embarking on a whole new career adventure. I have taken up a fulltime position with EdTechTeam as their Director of Professional Development for Australia & New Zealand. EdTechTeam is a California based company but has just started a local subsidiary here in Australia. As “a global network of educational technologists” with a mission of “improving the world’s education systems using the best learning principles and technology”, I’ve always been really impressed with what EdTechTeam are about. If you’ve ever been to a Google Apps for Education Summit, you’ve already had a small glimpse into the kinds of things EdTechTeam does, but there’s a whole lot of other things going on as well! Basically, imagine if you assembled a team of the most talented teachers in the world, who are all doing amazing things with technology in the classroom, and then ask them to go change the world. That’s what EdTechTeam is. 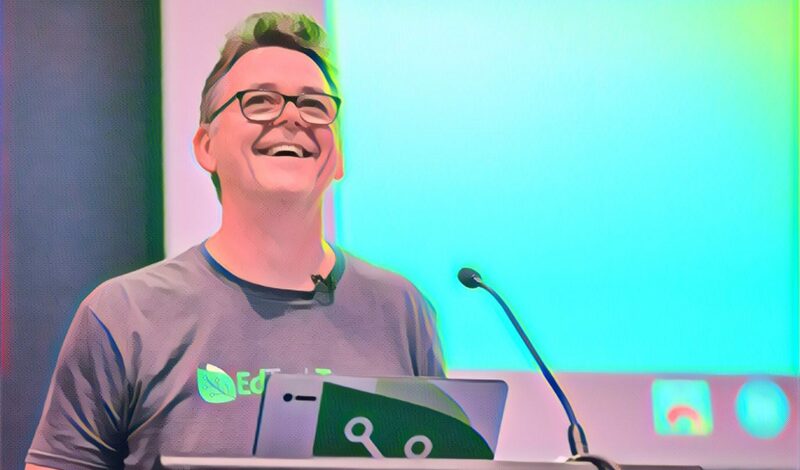 I’ve been doing work with EdTechTeam on a part time basis for the last few years, so I have a pretty good idea of what they are about; helping teachers understand and embrace the power of using digital technologies to improve student learning. I’ve been teaching in schools for nearly 30 years now. I’ve taught both boys and girls, in public, catholic and independent schools, in Australia and Canada. I’ve left teaching twice already to try other things, but always managed to find my way back to it. I love teaching. I love working with kids. I don’t know of any other career that lets one make a dent in the future in quite the same way that teaching does. The thing I love about teaching is that it puts you in a position where you can make a difference. That said, I think the work EdTechTeam is doing is impacting education on a much bigger scale. I think we are poised at an exciting moment in educational history, approaching a grand confluence of ideas, technologies and social change. I’ve been banging on about the need for change in schools and education for years now (as have many others) and I feel we are nearing a real tipping point in being able to create that positive change in education. If I can impact teachers – at scale – in helping drive that change, then that seems like a great place to direct my energy. As much as I will genuinely miss not being in classrooms with kids every day, the chance to have an impact on tens of thousands of educators each year, who then take that impact back into their own classrooms and apply it, seemed like an irresistible idea to me. In a school I might be able to influence 30 teachers. Last year EdTechTeam worked with over 30,000 teachers from around the globe. Many of those teachers went back to their schools and applied what we shared with them to dozens, or even hundreds, or kids. That’s what I find exciting! As I cleaned out my desk at PLC last week, I was finding documents and items from the past eight years. It really struck me just how much change has happened in those eight years. When I arrived at PLC in 2008 the tools, technologies and ideas about teaching were quite different to how they look now. When I started at PLC we did not have Google Apps. There were no Chromebooks or iPads. The App Store was in its infancy. Google Drive had not been invented. Streaming music and video was almost unheard of. Working productively on a mobile device was not possible. The idea of storing files in “the Cloud” was not even in the public consciousness. Yet all of these technologies and ideas have completely redefined the day to day experience of a contemporary classroom. There’s no doubt that stepping away from something you’ve always done is scary. Teaching is what I’ve done for a very long time and I’m comfortable with it. I even think I’m reasonably good at it. It’s so easy to just keep doing what you’ve always done. It’s much harder to step out of your comfort zone and try something new. So here I go. Starting in January I’ll be working with many more teachers here in Australia and New Zealand, as well as other parts of the world too. I know I’ll probably see way too much of the inside of airplanes and I know I’ll miss the daily contact with students like crazy. But as Helen Keller once said, life is either a daring adventure or nothing. The good part is that, along with my new colleagues, I’ll have the chance to work with teachers all over the world to create positive educational change and to help them see just how powerful learning can be with the right tools and ideas. I hope I get a chance to work with some of you over the next few years too. Let’s change the world together.